The title of this post was suggested by Raizel. This week, we had a night of firsts. Both of the girls are growing up! Raizel made scrambled eggs all by herself! As I have shared, I have an airborne egg allergy. I have been waiting for the day that she could make her own eggs. Raizel even initiated making the eggs on her own. She cracked the eggs into the glass to check them one at a time. 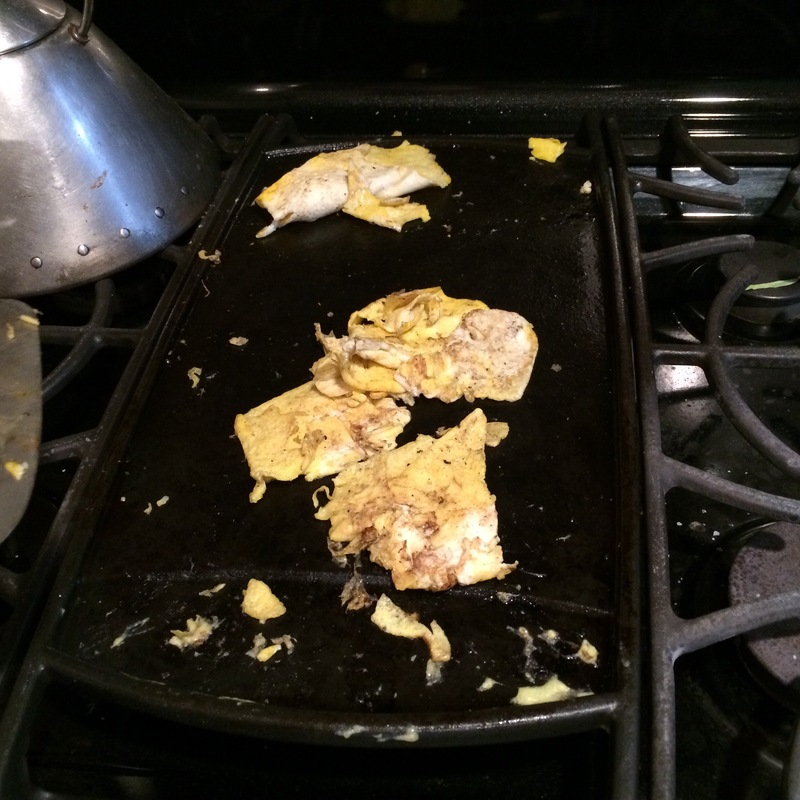 Then, she scrambled the eggs up, and placed them on the hot grill. On the griddle and ready to flip. 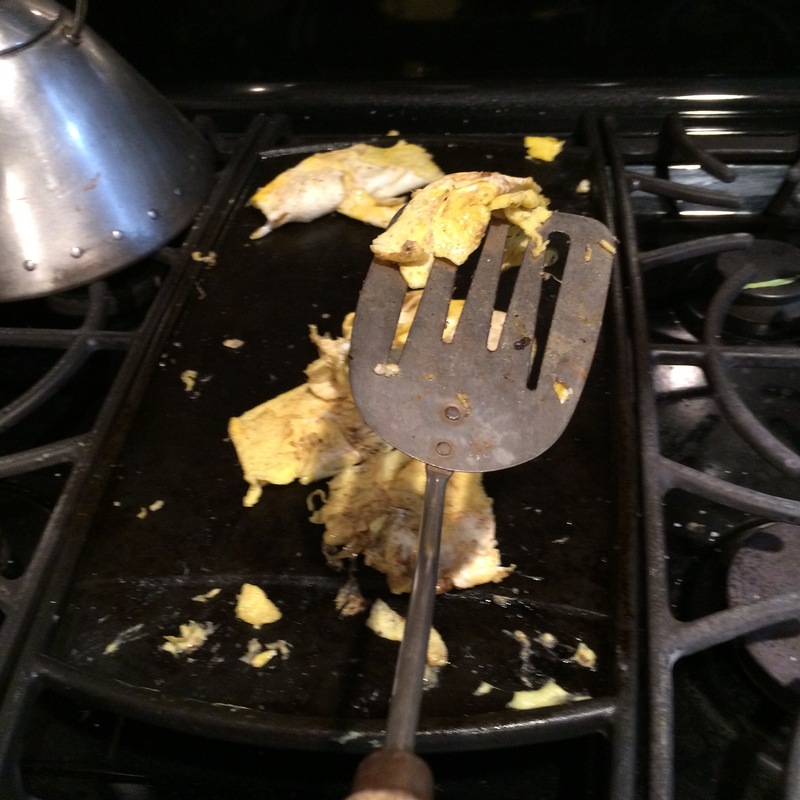 The first time that Raizel used a spatula on a hot stove. For those who may not know, eggs are kosher as long as they are from a kosher bird and do not have any blood spots. 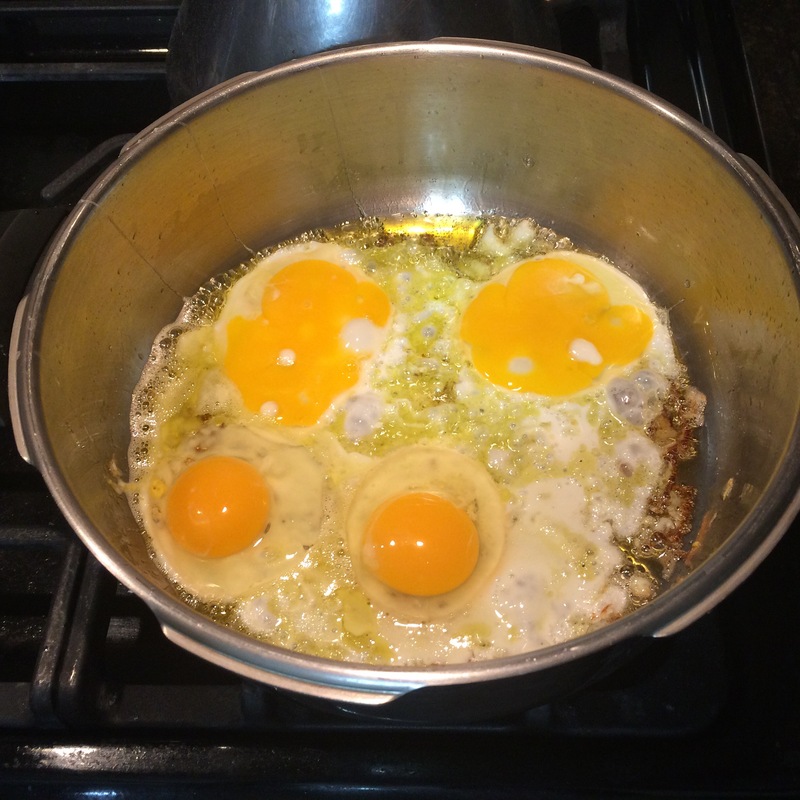 When cooking with eggs, each egg is opened into a clear dish or glass and checked for blood spots before it is cook or combined with other food. If a blood spot is found, the whole egg must be discarded, and the cup or dish should be immediately and thoroughly washed with cold water. When boiling eggs, it is customary to boil at least three eggs at a time. Some people have a separate pot just for boiling eggs. If a blood spot is found in a boiled egg, the whole egg must be discarded. Eggs are also pareve, which means they can be eaten with dairy (milk) or meat. I couldn’t believe that on her own, Raizel knew to check the eggs for blood spots before cooking them! Raizel was very proud! Even the next morning she was still glowing with pride that she make scrambled eggs all by herself. I am even prouder. I guess we are all in love with the new grill! In addition, it cleans up very easily. I just wiped it off with a damp sponge. 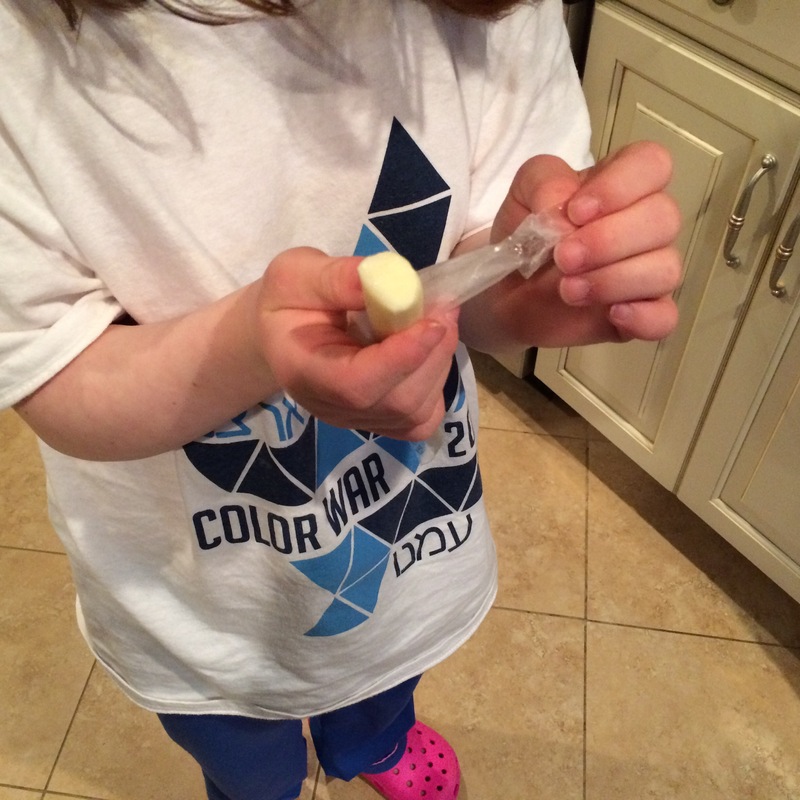 Our second moment of firsts was that Yaffa opened up a cheese stick all by herself. 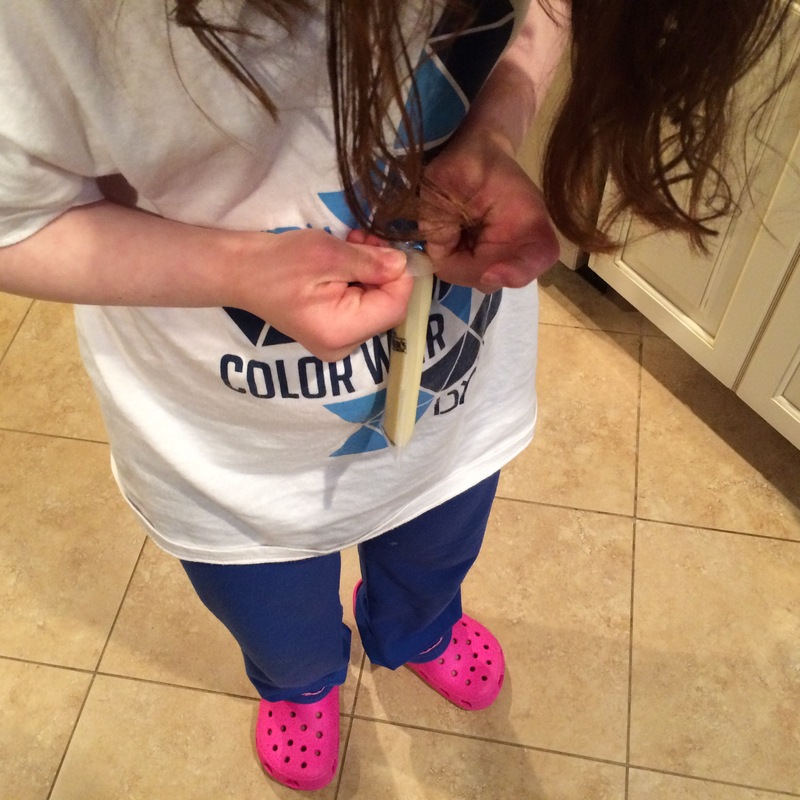 Taking the cheese stick in her hands. Success! Pulling the plastic down. Success! Able to eat it all by herself! It was hard work and she got a little frustrated, but she did it! She even went back to fetch a second one. It’s amazing was a little motivation can achieve! Now, she is asking to eat cheese sticks all the time! My children are both in public schools. Consequently, there are usually very few other children at school who also keep kosher. Events where there is food involved take a bit of planning. If there is a birthday party for a classmate, or another special event around food, I will send in a similar kosher item for the girls to eat. I try to make whatever I send appealing and special. I hope that this way, neither one of them will feel left out or deprived. Last week, Raizel’s class went to a local diner for brunch. The goal was to learn how to speak to a waitress, communicate what you want to eat, stick to a budget, handle money, etc. This always presents a quandary for me. While I am happy to have Raizel learn these tasks, I struggle with what she will eat, when she cannot eat anything that she orders. Raizel explained her dilemma to her teacher, who then asked if he could speak to me. As a member of a religious minority, I very often have to explain to their teachers and the administrators about our food restrictions. Her teacher was very kind and respectful. It was his suggestion that I send Raizel to the restaurant with kosher food that she could eat with her class. This time, I made Raizel pancakes, using our new wonderful stove top grill. Since pancakes are not very popular in our house, I only wanted to make just enough pancakes for one serving. Mix the flour, baking powder, salt and sugar in a bowl. 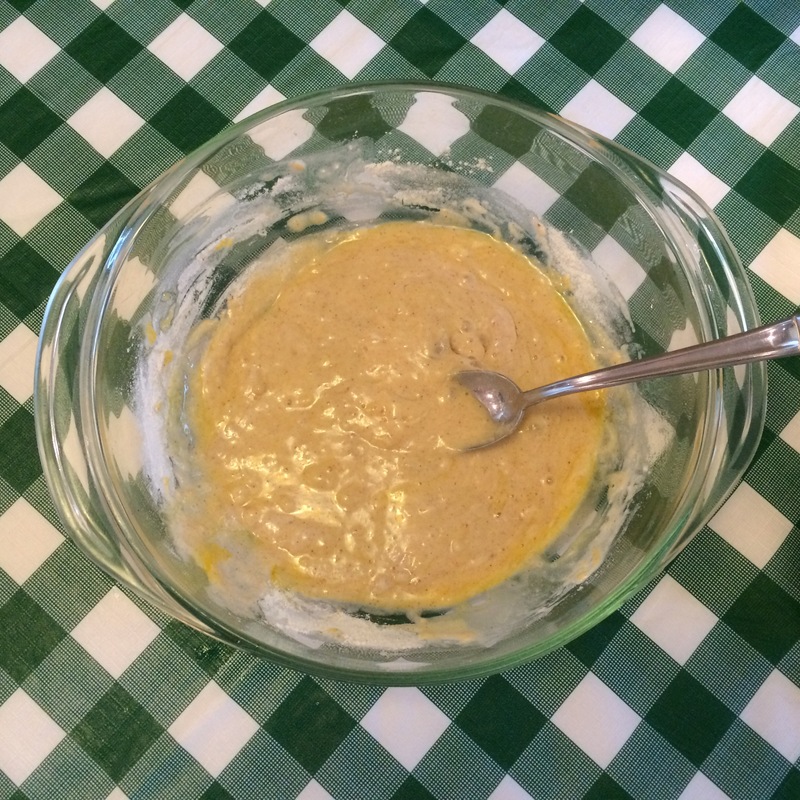 Then, add the egg, oil, milk and vanilla and stir until smooth and well mixed. Spray oil the grill and heat over a medium hot flame. When the grill is hot, pour batter onto the grill until desired size and cook on one side until lightly browned. 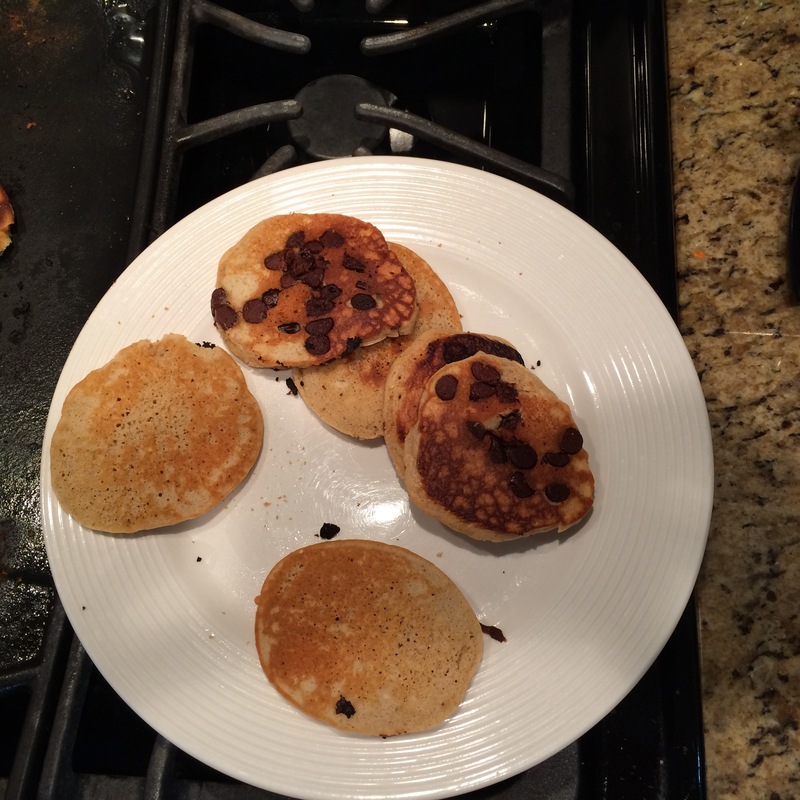 I added chocolate chips on top of each pancake. 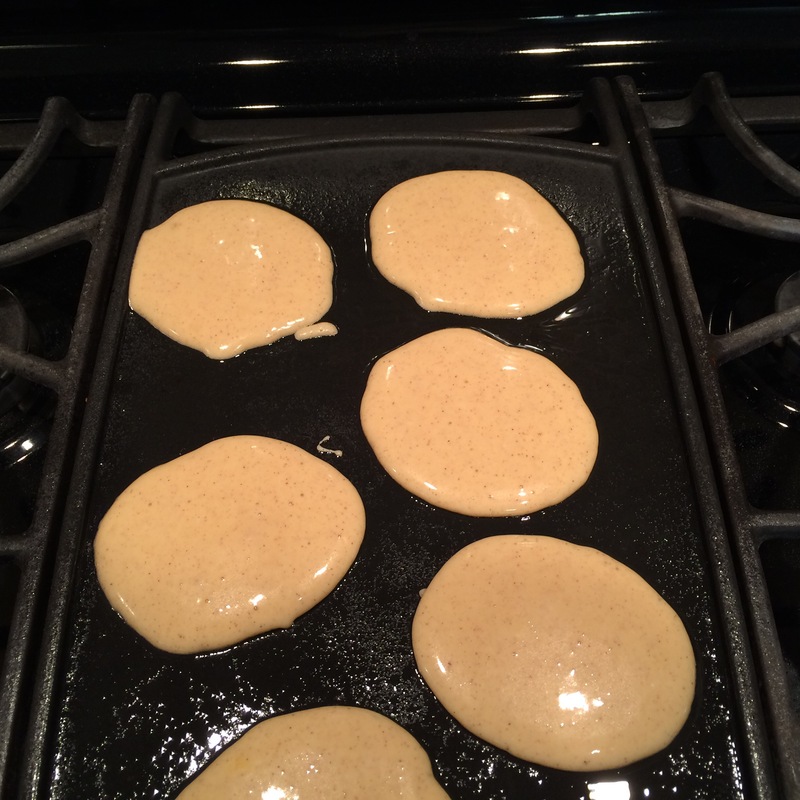 Then, using a spatula, turn each pancake over and cook on the other side. For waffles, cook according to the settings recommended for the waffle maker. I served the pancakes with maple syrup. 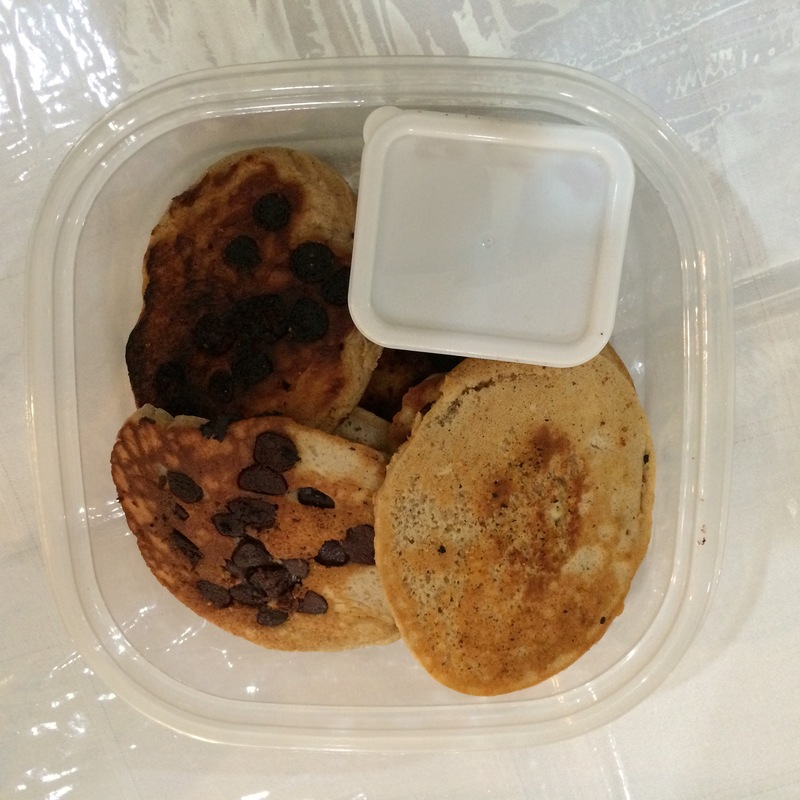 When I packed the pancakes in a container, I added the maple syrup inside the container with an even smaller container. The pancakes came out great and Raizel loved them! I think that now that we have this wonderful stove top grill, I am likely to be making pancakes more often. Since I only spray oiled the grill, they came out light and fluffy and not greasy. 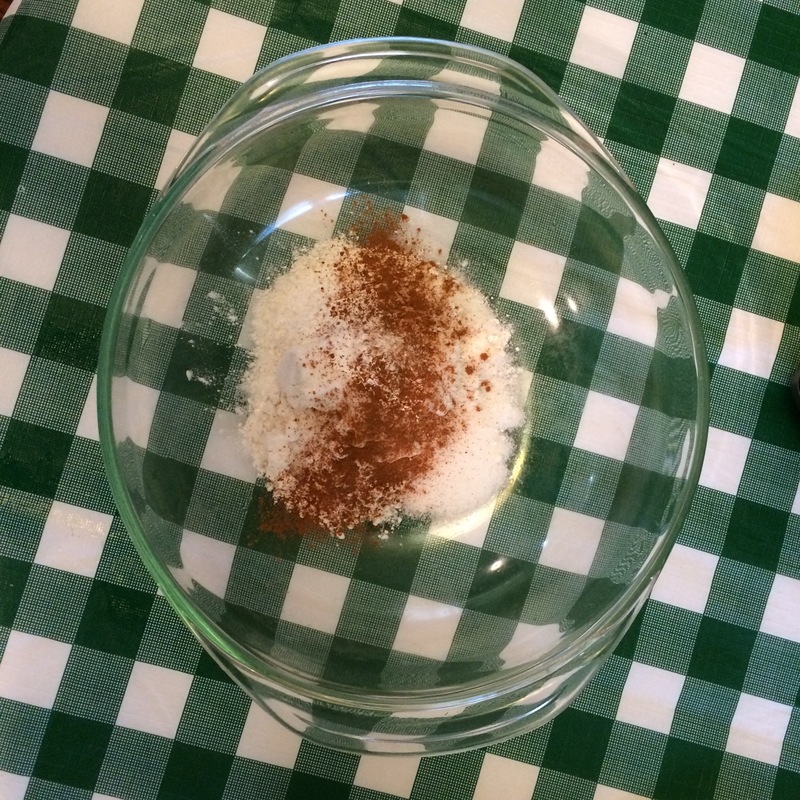 Mixing the dry ingredients in a bowl. The batter mixed up until smooth. 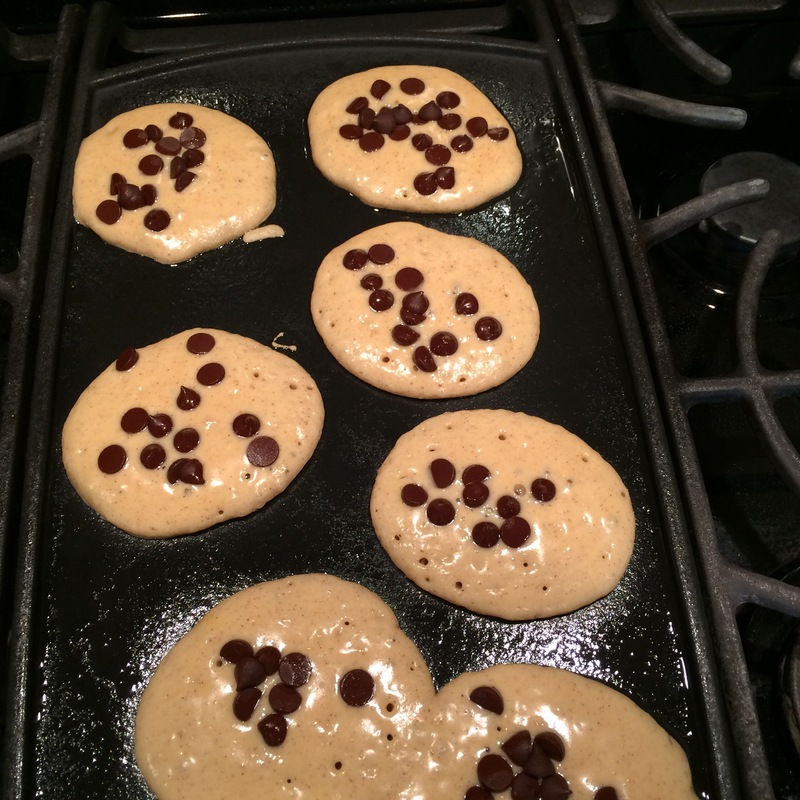 Chocolate chips added on top. I wrote this at the beginning of the week. But, with the move, I am only posting it now. So, please think of this as being posted 5 days ago. We are still in the process of transitioning to our new house. Boxes are everywhere and it is getting difficult to maneuver. On top of everything, Raizel and now my husband both caught a very nasty stomach bug. So, I had a week of packing boxes and doing lots of laundry. In light of our household activity, I thought I would take a moment to share my thoughts on how to eat when affected by gastroenteritis, or vomiting and diarrhea. As a nurse and an acupuncturist, and a mother of medically challenged children, I have lots of experience with this subject area. When I was in school, I remember it was commonly recommended for people to follow the B.R.A.T. diet: bananas, rice, applesauce and toast. Personally, I do not believe that one needs to be strictly limited it to the B.R.A.T. menu. I believe that people should eat easy to digest food that is gentle on the stomach. In my experience, food should be introduced as tolerated. I have found oatmeal or cooked cereal, potatoes to work as well. The most important thing is to stay well hydrated. When Yaffa was a baby, we used to give her pedia-lite through her feeding tube. I think it prevented multiple hospitalizations many times. Thank God, our feeding tube days are in the past. I consider it to be somewhat miraculous that I so far (knock on wood, or “poo poo” as we say) I did not catch have this very nasty bug. Since I ran out of herbal tea, I started drinking hot water with a fresh squeezed lemon. I do not know the mechanics, but I believe that there is something very medicinal about fresh lemon juice. Parenthetically, I also used ammonia and/or borax and soap to clean up. My theory, as yet unproven, is that any potential contamination was killed by the acidity of the lemon juice together with the ammonia or borax. So, while Jay and Raizel were sick, neither of them had much of an appetite. As they were beginning to build up an appetite, Jay was only interested in eating eggs. This is not necessarily unremarkable. The only problem is, I have an airborne egg allergy. It is one of those strange allergies that really affects my life. 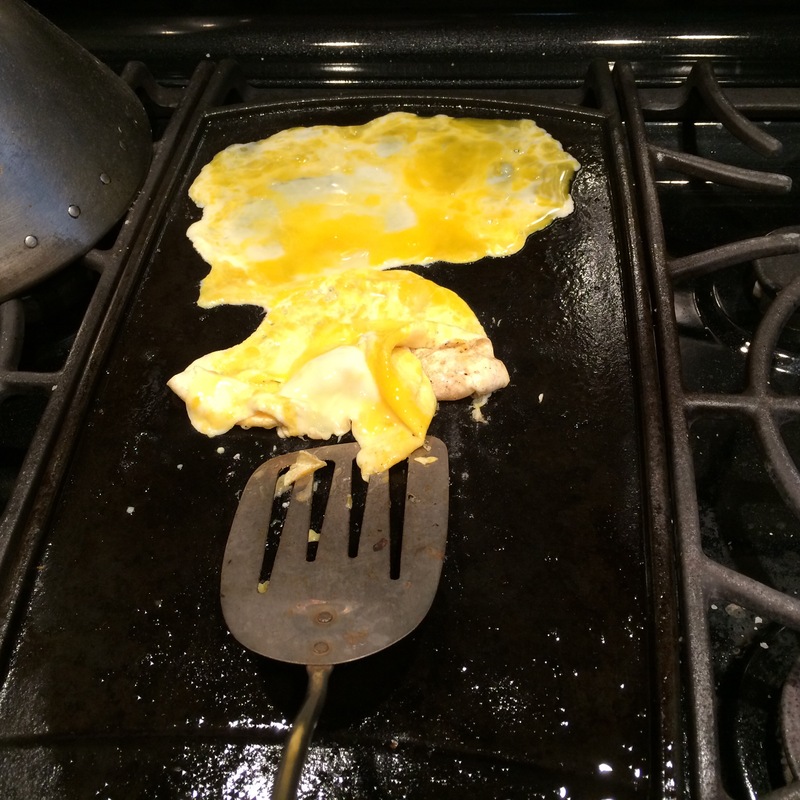 Eggs over hard are my husband’s favorite way to eat eggs. 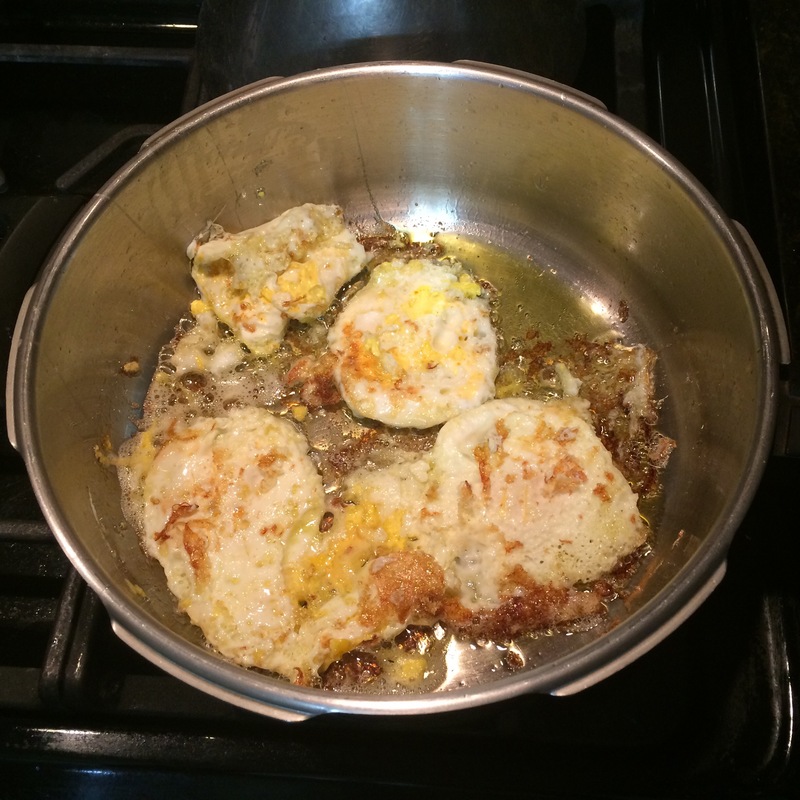 My husband says that eggs over hard means breaking the egg into the frying pan, and, while it is still cooking, break the yolks prior to flipping it over. Break the yoke and let it run a little bit. 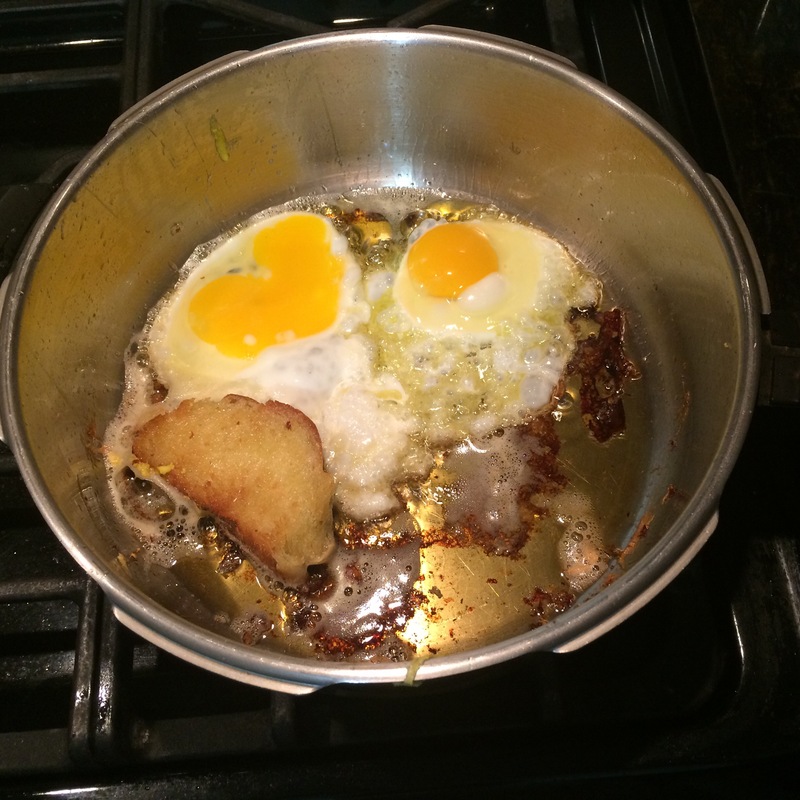 Frying the egg and breaking the yoke and letting it run a bit. 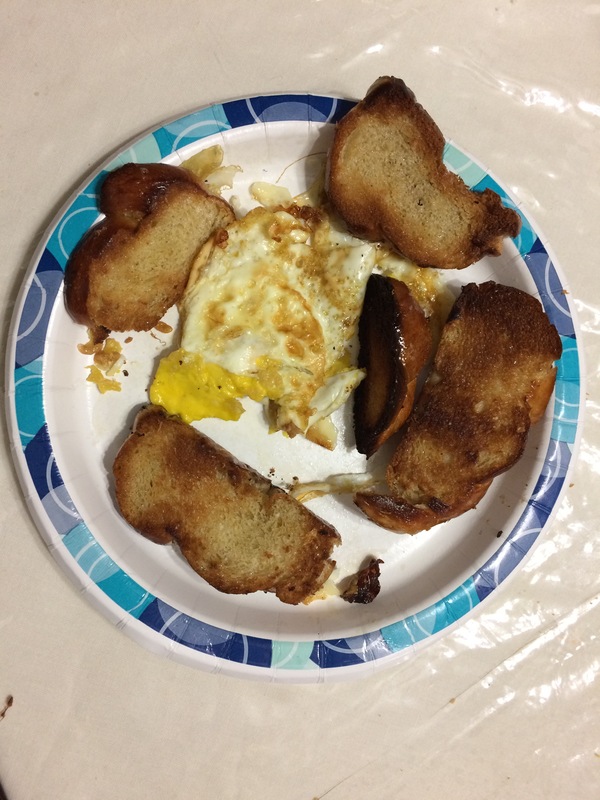 The final product: over hard eggs with fried bread. My husband and Raizel were soooooo happy. I made them 2 days in a row. I also added fried bread since our toaster was packed. I was so happy to see them eating again! Not only that, the open window and using the fan seemed to work — no ill effects from being around eggs while they are cooking! My next goal is to teach Raizel how to make them herself, so I won’t have to worry about avoiding the fumes. During the week of Chanukah, we had our own personal miracle story. Our morning routine is that I get Yaffa dressed, make her breakfast and lunch and give her her medicine, etc. before going to work. Then, before Raizel goes to school, she puts Yaffa on the bus. Last week, Yaffa needed oral surgery to remove 4 baby teeth which were impacted and preventing her adult teeth from growing in. On the day of the surgery, I called the bus company and told them not to pick Yaffa up. However, the bus came anyway. Yaffa, who knows how to follow a routine better than anyone, put herself on the bus. Thank God, Raizel saw what happened and pulled Yaffa off the bus and brought her back into the house! Incredibly, all of this transpired without my husband even being aware of it. Not only that, but, Raizel was still able to get to her bus stop on time and make it to school. Raizel really saved the day! 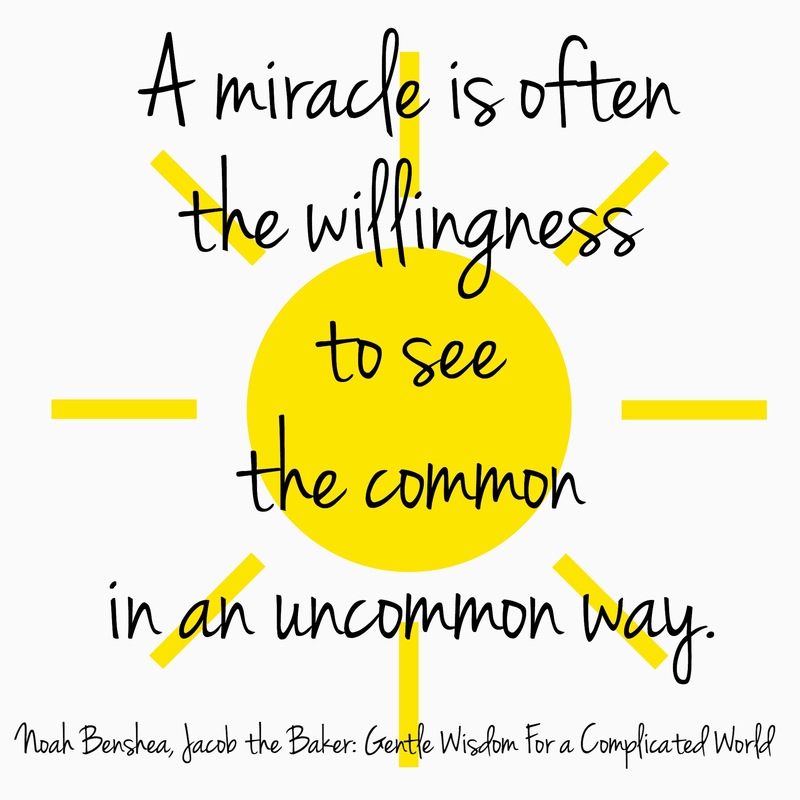 Miracles are what happen in our ordinary lives when we are willing to see how extraordinary the mundane really is. After having her teeth pulled Yaffa was in so much pain that she was unable to chew and went back to eating only very soft and pureed foods. As I have shared, Yaffa used to be on a feeding tube. The road to teaching her how to eat food by mouth and to bite, chew and swallow food has been a long and tortuous journey. Every food milestone that might be taken for granted with other children, was only attained after great effort — baby step by baby step. 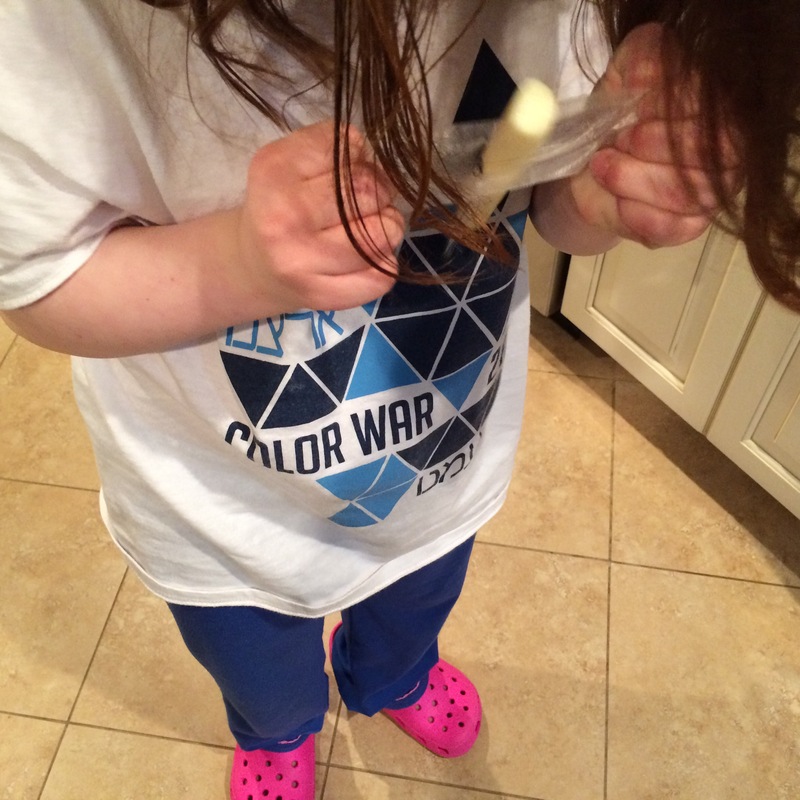 Given her history, we are very regimented in forcing Yaffa to eat foods that require chewing. So, for a week now, Yaffa has not eaten her usual breakfast of prune juice, a banana and cereal with milk. For the first few days she would only eat apple sauce and oatmeal. She has now gone back to eating a banana. Getting her to eat dried cereal with milk again appears to be a bit of a challenge. 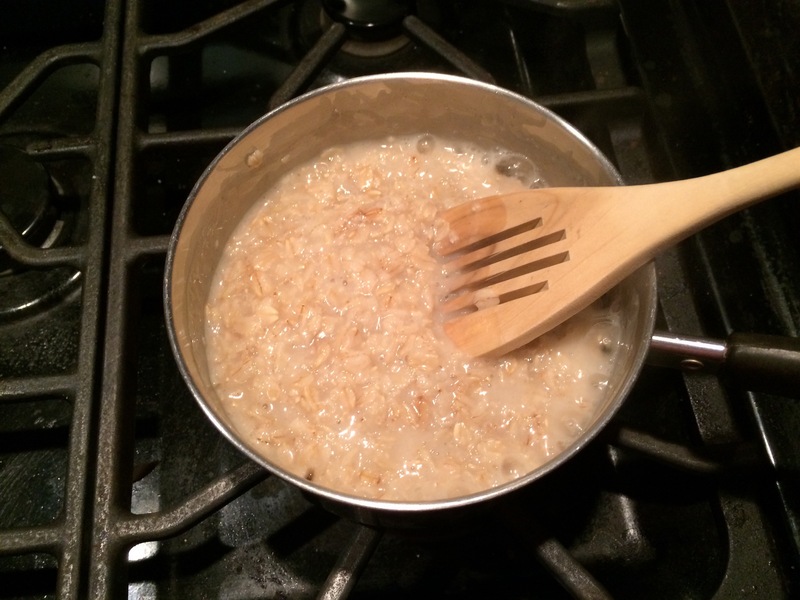 So, in light of our current situation, I thought I would take a moment to write about how to make oatmeal. Believe it or not, there is an art to making the perfect bowl of oatmeal, and everyone has their preferences. One way is to boil the water first, and then add the oatmeal, using a 2:1 ratio of water to oatmeal. Simmer over a low or medium-low heat until desired thickness. 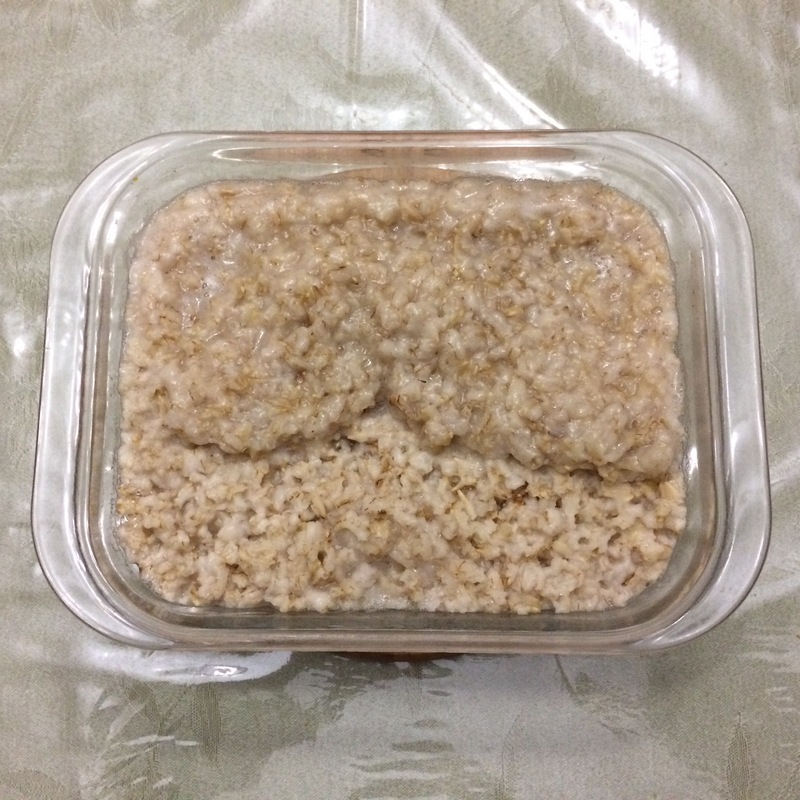 When the oats are added after the water boils, the oatmeal has a thicker texture. The other way is to boil the oatmeal together with the water and then simmer it over a low or medium-low heat until desired thickness. This way the oatmeal is more creamy and smooth. So, when the oats are added to the water determines the consistency of the oatmeal. The longer the oatmeal cooks, the thicker and softer it is. Naturally, each person in our house has their preferences. 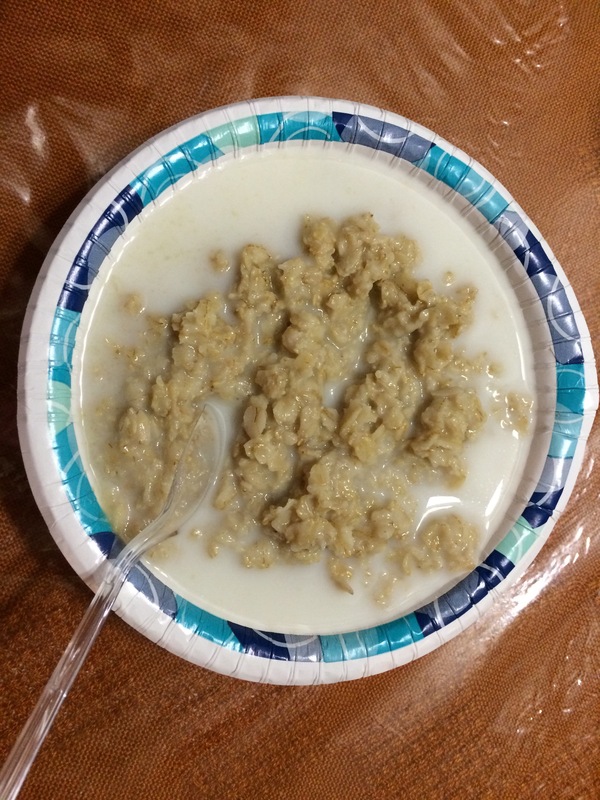 Growing up, we would sometimes cook the oatmeal with milk or water and serve it with butter and brown sugar. Now we cook it in water, and serve it with a splash of milk and maple syrup. Sometimes, we add a pinch of salt. Cinnamon gives a touch of natural sweetness too. 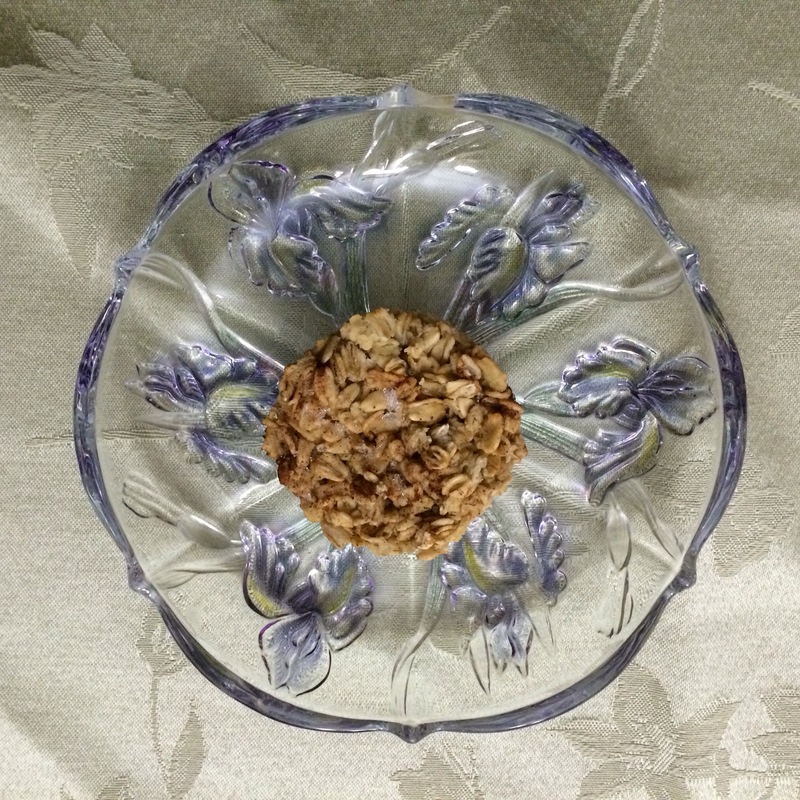 Other ways of serving oatmeal include adding dried fruit, fresh fruit, sunflower seeds, nuts, or any combination of the above. My particular favorite is adding frozen cranberries and nuts. There are also various types of oatmeal: instant, rolled and steel cut. Interestingly, the rolled oatmeal in Canada is thicker and has more texture than the rolled oats available in the US. When we go back to Canada, we always like to stock up. Steel-cut oats have the most distinctive and almost nutty taste compared to other types of oatmeal. Unfortunately, they also take the longest to cook. 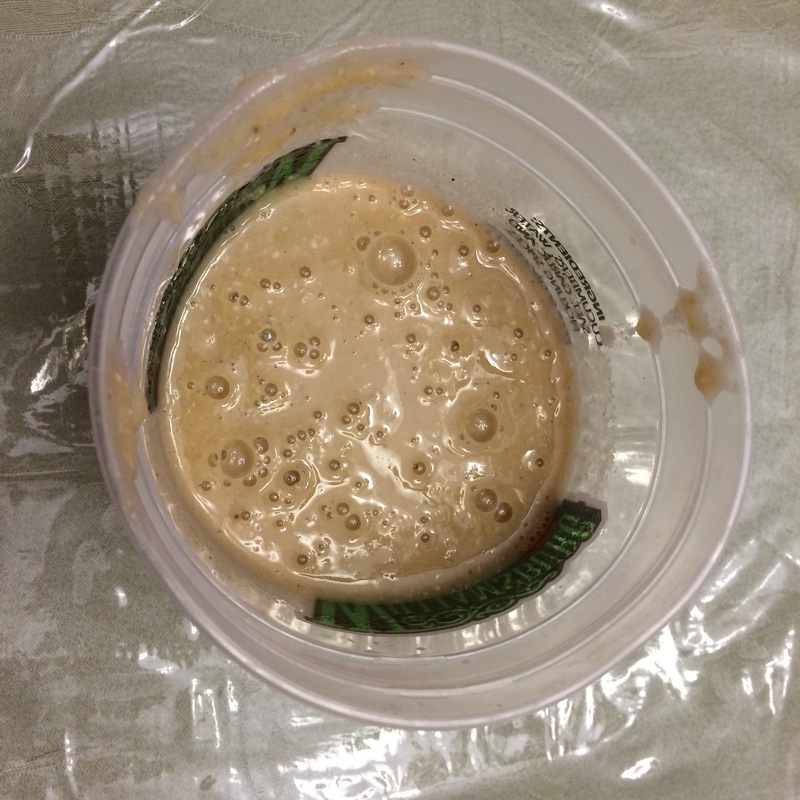 When Yaffa was in the early stages of being weaned off of the feeding tube, we tried using instant oatmeal, without much success. When we were at that stage, I would make the oatmeal and then puree it with an immersion blender to make it extra smooth, which worked better. Oatmeal can be made on top of the stove, in a crockpot, overnight in the fridge inside a jar, in the microwave and even eaten raw, with yogurt. We tend to make it on top of the stove, or in the microwave. I also make “oatmeal rolls” and bake the oatmeal in a muffin pan. Spray oil muffin pan. Add oatmeal, salt and cinnamon into each muffin cups. Pour water to top and let sit until water is absorbed. This can also be done the night before, covered and refrigerated. Bake at 350-375 degree oven until done. These travel well, and can be frozen and defrosted as needed. Baked oatmeal can also be flat like a pancake, but I find that it falls apart too easily. The humble oatmeal can be dressed up or dressed down in so many ways. 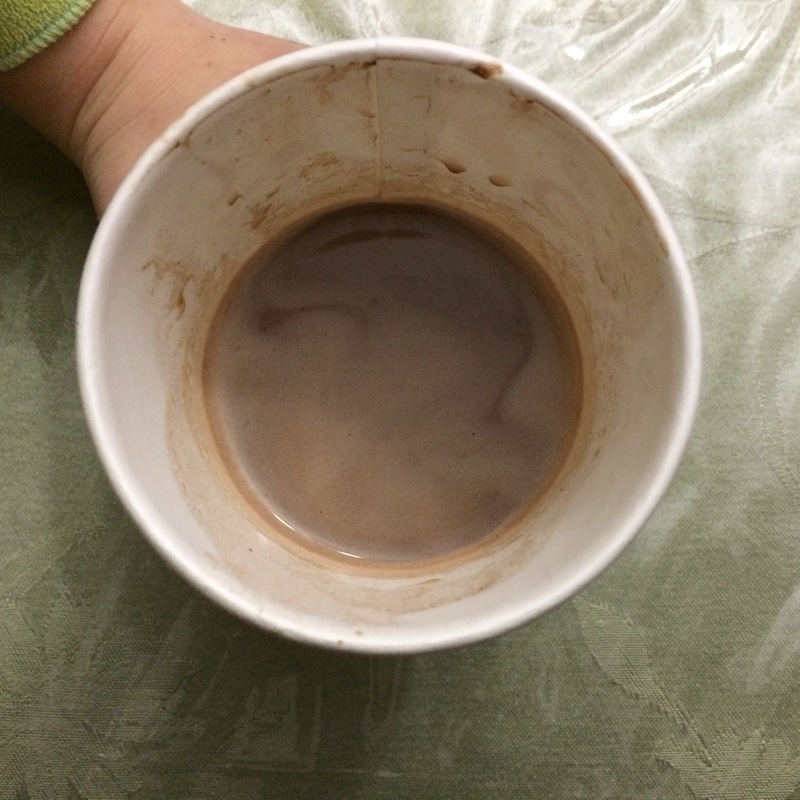 Last night and this morning, Raizel decided that she wanted to make hot chocolate. For many people this sounds like a relatively straightforward activity. For Raizel, however, it became an opportunity to rise above some of her challenges. The second time, she misread the instructions and microwaved the cocoa and sugar in a paper cup without any milk. The cup burnt. The third time was a charm. It tasted great and Raizel was very happy! She would only let me take a picture while she was holding it! Mix all ingredients together and microwave on high for 2 minutes. Blend together and drink while warm. Something so simple was a wonderful opportunity for growth! We had a bonding experience. I guess sometimes it’s the little things in life that matter. 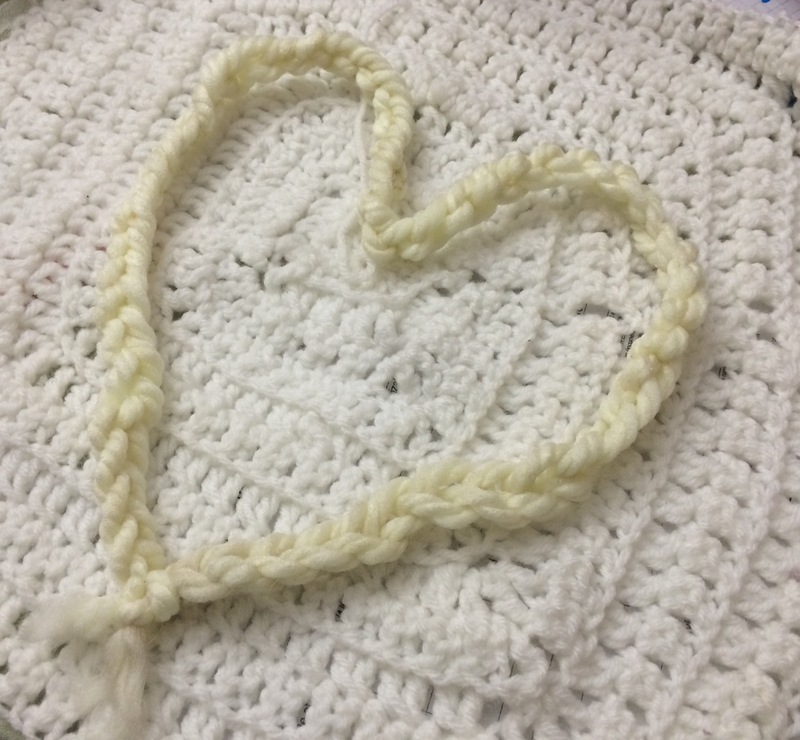 Raizel made the chain stitches for the heart. 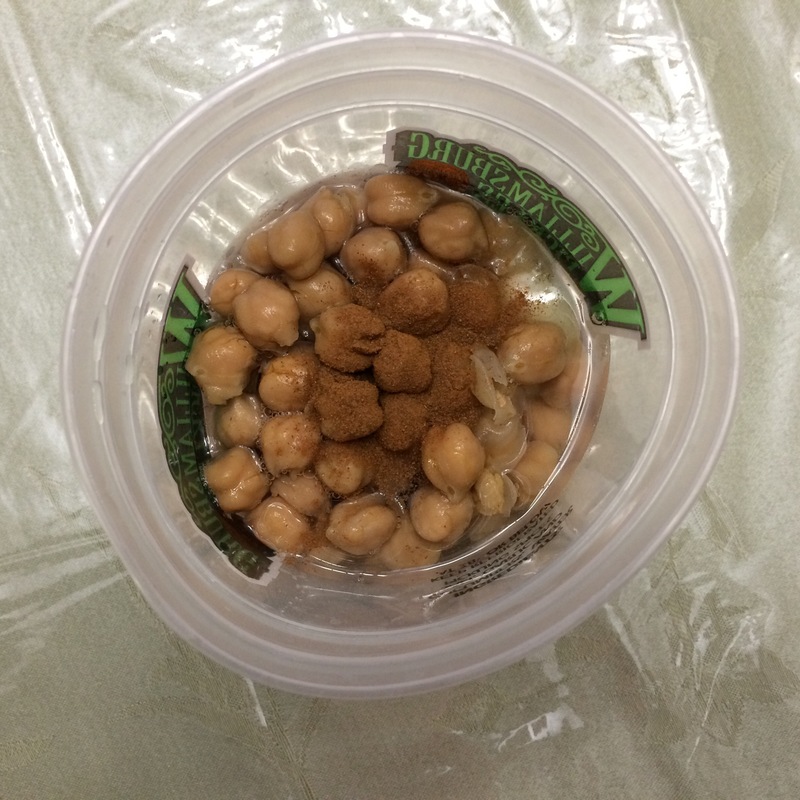 This morning I made a variation of my breakfast smoothie using chickpeas instead if nut butter. I know it sounds unusual, but it really works! I place everything in a container and using an immersion blender, purée until smooth. Et voila– breakfast on the go. Drink using a thick straw.